RIBASIM is a model package to analyze the consequences of infrastructure and water use developments. It is a comprehensive and flexible tool for simulating the behavior of river basins under various hydrological conditions. RIBASIM links the hydrological water inputs at various locations with the specific water-users in the basin. RIBASIM enables the user to evaluate a variety of measures related to infrastructure, operational and demand management and to see the results in terms of water quantity, water quality and flow composition. River basin modellers, river basin planners, river basin managers, irrigation system managers, researchers, educational staff, MSc and PhD students. 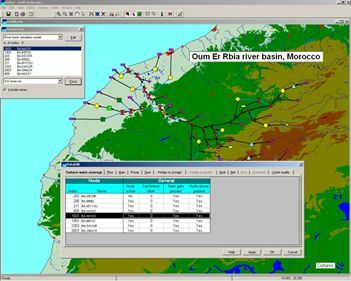 RIBASIM enables a schematization of the river basin to be prepared interactively from a map. This schematization consists of a network of nodes connected by branches. The nodes represent reservoirs, dams, weirs, pumps, hydro-power stations, water users, inflows, man-made and natural bifurcations, intake structures, natural lakes, swamps, wetlands, etc. The branches transport water between the different nodes. Such a network represents all of the basin’s features which are significant for its water balance and it can be adjusted to provide the level of detail required. The river basin is presented as a map over which the network schematization is superimposed as a separate map layer. The background map can be produced by any Geographical Information System (GIS). 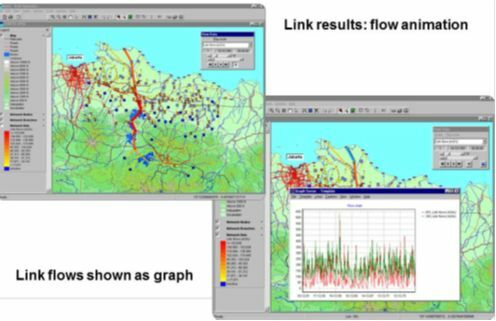 The attribute data of the network elements are entered interactive and linked to the map of the river basin and its network schematization. Data consistency tests are an integral part of the tool. Simulations are usually made over long (multiple years) time series to include the occurrence of dry and wet periods. Within each time step, the water demand is determined, resulting in targets for water releases from reservoirs, aquifers, lakes, weirs and pumping stations. Then, the water is allocated to the users according to the release targets, water availability, operation rules and water allocation priorities. 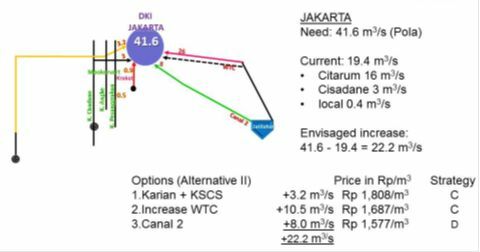 Water allocation to users can be done in several ways: at its simplest, water is allocated on a "first come, first served" basis along the natural flow direction. This allocation can be amended by rules which, for example, allocate priority to particular users, or which result in an allocation proportional to demand. RIBASIM has been developed and fine-tuned since 1985 at Deltares (previously Delft Hydraulics) in the course of many projects. RIBASIM has been applied in more than 30 countries world-wide and is used by a wide range of national and regional agencies. Countries where the model has been applied include Argentina, Azerbaijan, Bangladesh, Brazil, Canada, Central Asian republics (Aral Sea catchment), Chile, China, Czech, Egypt, Equatorial Lakes, Ethiopia, Greece, India, Indonesia, Iran, Iraq, Italy, Kenya, Lesotho, Malaysia, Mali, Mongolia, Morocco, Myanmar, Nepal, Peru, Philippines, Poland, Portugal, Senegal, Sudan, Taiwan, The Netherlands, Tobago, Trinidad, Turkey, Ukraine, and Viet Nam. 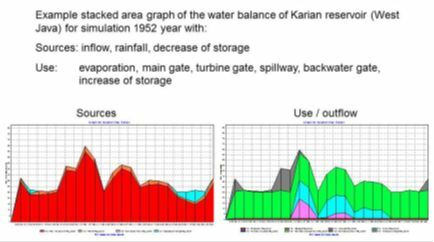 Required data are data on hydrological time series (for example of surface water runoff, rainfall and open water evaporation), aquifers, water users, infrastructure and its operation (dams, weirs, pumps, canals) and priorities for water allocation. 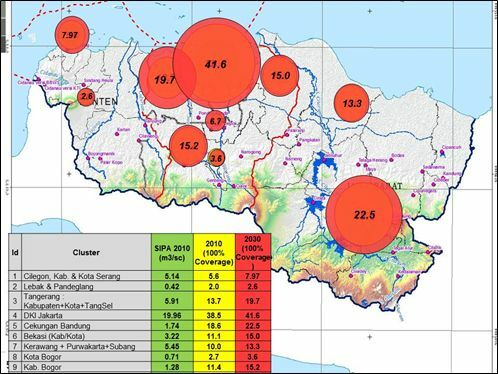 Depending on the detail of modeling data are needed on crop, cultivation, yield and production costs, number of inhabitants per population type, concentration of various substances in drainage flows, and reservoir sedimentation data. 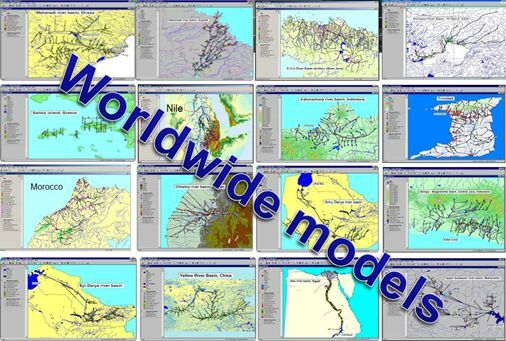 The detail in spatial scale is determined by the river basin modeller when he/she designs the network schematization and develops the model. This may vary from local to continental, from part of a basin to various basins, from part of an irrigation area to a number of irrigation areas. The default simulation time steps are day, week, decade, half-month and month. For research and educational purposes RIBASIM is available with a temporary license. For commercial purposes a time-limited or time-unlimited license must be bought. Manuals incl. a quick start guide are available. Introduction and advanced training courses can be requested at Deltares (Ribasim.info(at)Deltares.nl). RIBASIM is trained and used in various educational programs at Unesco IHE. 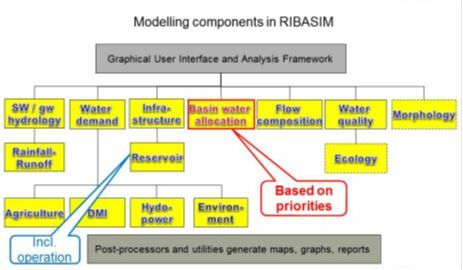 RIBASIM does not require any third party software and includes all components to develop a water demand and allocation model for any basin. Questions can be mailed to the Deltares support. A maintenance and support agreement can be set.